McGrady was born on May 24, 1979, in Bartow, Florida, to Melanise Williford. His father was not a part of his everyday life, so Melanise raised McGrady with the help of her mother, Roberta, in Auburndale. As a youth, McGrady played high school basketball and baseball at Auburndale High School for three years before transferring to Mount Zion Christian Academy in Durham, North Carolina for his senior season. A relatively unknown player coming out of Florida, he made a name for himself after a strong performance at the Adidas ABCD Camp, an experience that helped McGrady recognize his true talent. He later reflected, "Nobody had a clue who Tracy McGrady was. Sonny Vaccaro gave me that platform, and I played against the best players in the world at that time. I left that camp the No. 1 player in the nation, 175 to No. 1." Behind his leadership, Mt. Zion emerged as the number two-ranked team in the country, and McGrady was named a McDonald’s All-American, national Player of the Year by USA Today, and North Carolina's Mr. Basketball by the Associated Press. Initially, McGrady considered playing college basketball at the University of Kentucky, but he ultimately decided to enter the NBA draft as he was a projected lottery pick. McGrady was selected as the ninth overall pick by the Toronto Raptors in the 1997 NBA draft. For most of the 1997–98 season, he received little playing time, averaging only 13 minutes per game under head coach Darrell Walker. McGrady has described his rookie year as "hell", feeling lonely in Toronto and sleeping for up to 20 hours a day. Late in the season, Walker resigned, and McGrady began playing more under new coach Butch Carter, who agreed to increase McGrady's minutes on the condition that McGrady would improve his work ethic. Before the lockout-shortened 1998–99 season, the Raptors drafted McGrady's distant cousin, Vince Carter. The two became inseparable; teammate Dee Brown once said, "They say they're cousins... But Siamese twins is more like it." By the 1999–2000 season, the duo had developed a reputation for their athleticism, giving memorable performances at the All-Star Weekend Slam Dunk Contest. McGrady, now playing significant minutes, was a contender for the Sixth Man of the Year Award before being elevated to Toronto's starting backcourt in late March. Behind McGrady and Carter's play, the Raptors finished the season with a 45–37 record, qualifying for the playoffs for the first time in franchise history. McGrady's final averages were 15.4 points, 6.3 rebounds, 3.3 assists, and a career-high 1.9 blocks per game. In the first round of the postseason, the Raptors were swept by the New York Knicks. Following Toronto's first-round exit, McGrady became a free agent, signing a six-year, $67.5 million contract with the Orlando Magic. He elected to join the Magic in part because he disliked his secondary role playing behind Vince Carter, in part so that he could return home to Florida, and in part to play with their other newly acquired free agent, Grant Hill. Hill would go on to play in only 47 games total throughout his tenure with the team, forcing McGrady into a more significant leadership and scoring role than anticipated. During the 2000–01 season, McGrady defied the expectations of many, emerging as one of the best players in the NBA, with Milwaukee Bucks General Manager Ernie Grunfeld going so far as to call him "one of the top five talents in the league". McGrady's play earned him his first All-Star Game appearance and, behind averages of 26.8 points, 7.5 rebounds, and 4.6 assists per game, he was selected to his first All-NBA Team, being named to the All-NBA Second Team. He was also voted the league's Most Improved Player. With a 43–39 record, the Magic entered the playoffs as the East's seventh seed, drawing a matchup with the Bucks. In Game 3 of the series, McGrady notched 42 points, 10 rebounds, and 8 assists in a performance that Bill Simmons later called McGrady's "superstar audition tape". Orlando was eventually eliminated by Milwaukee in four games. For the 2001–02 season, McGrady averaged 25.6 points, 7.9 rebounds, and 5.3 assists per game, earning his second All-NBA Team selection, this time to the All-NBA First Team. During that year's All-Star Game, he completed one of the most memorable highlights of his career, throwing the ball off the backboard to himself and completing an alley-oop in traffic. At season's end, the Magic were again ousted in the first round of the playoffs, losing in four games to the Charlotte Hornets. In 2002–03, McGrady won his first scoring title and, behind averages of 32.1 points, 6.5 rebounds, and 5.5 assists per game, finished a career-best fourth in NBA Most Valuable Player Award voting. ESPN later ranked his season one of the best ever for a perimeter player. In Game 1 of the playoffs, he scored 43 points to help Orlando take an early series lead against the top-seeded Detroit Pistons. The Magic would go on to take a commanding 3–1 lead, and McGrady made headlines when he prematurely assumed that Orlando were guaranteed to advance to the next round, replying in an interview, "It feels good to get in the second round." Despite holding the series lead, the Magic were eliminated in seven games. The 2003–04 season was a tumultuous one for McGrady; Magic coach Doc Rivers was fired after a 1–10 start to the year and there were reports of friction between McGrady and Orlando General Manager John Weisbrod. Throughout the season, Orlando struggled because of a series of injuries, finishing the year with the worst record in the East despite McGrady winning his second consecutive scoring title. Late in the season, McGrady scored a career-high 62 points in a winning effort versus the Washington Wizards. His final averages were 28 points, 6 rebounds, and 5.5 assists per game. On June 29, 2004, McGrady, Juwan Howard, Tyronn Lue, and Reece Gaines were traded to the Houston Rockets as part of a seven-player deal that sent Steve Francis, Cuttino Mobley, and Kelvin Cato to the Magic. In response to the trade, McGrady stated that he was happy with the situation and expressed excitement over the prospect of playing alongside Rocket All-Star center Yao Ming. Shortly after arriving in Houston, McGrady signed a three-year, $63 million contract extension with the team. The Rockets struggled to begin the 2004–05 season, posting a losing record of 16–17 through their first 33 games. In December, McGrady had one of the most memorable performances of his career, scoring 13 points in the final 35 seconds against the San Antonio Spurs to secure a comeback victory. The sequence included four consecutive three-pointers, one of which was part of a four-point play and the last of which was a game-winner in the final two seconds. After the All-Star break, Houston rebounded from their slow start, finishing the season with 51 wins and the third-best record in the West. McGrady's final averages were 25.7 points, 6.2 rebounds, and 5.7 assists per game. In Game 2 of the first round of the postseason, he had another signature performance, completing a "thunderous" dunk over 7'6" Dallas Mavericks center Shawn Bradley and hitting a game-winner for a 113–111 victory. The series would go to a decisive Game 7, where McGrady came out cold, missing his first seven shots en route to a 40-point loss. 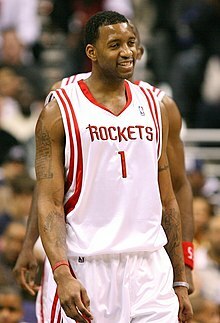 The 2005–06 season was a disappointing one for the Rockets, as McGrady appeared in only 47 games due to injury. At various points during the year, he missed time due to back spasms, including a moment in January where he had to be carried off the court in a stretcher due to a severe flare up. Despite his health concerns, McGrady was able to play in that year's All-Star Game in front of his home crowd in Houston, exploding for 36 points in just 27 minutes. For the season, he averaged 24.4 points and 6.5 rebounds per game. Due in part to his frequent absences, the Rockets failed to qualify for the playoffs. Early in the 2006–07 season, McGrady missed seven games, again because of back spasms, eventually deciding to visit a doctor and receive treatment for the injury as he felt that it was affecting his speed and explosiveness. His health issues and the ascension of Yao Ming, who was having a breakout season, resulted in McGrady temporarily becoming the team's second scoring option. His final averages were 24.6 points, 5.3 rebounds, and 6.5 assists per game. To open the playoffs, the Rockets were matched up the Utah Jazz. By this time, pressure had started to mount on McGrady to lead the team deep into the postseason, to which he responded, "If we don’t get out of the first round, it’s on me!" Houston would eventually lose the series in seven games, and at his postgame press conference following the Game 7 defeat, McGrady, still visibly emotional from the loss, said "I tried, man, I tried." 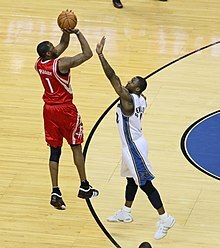 In 2007–08, the Rockets went on a 22-game winning streak, the then-second longest in NBA history, despite missing Yao Ming during that stretch. During their run, McGrady expressed optimism over the team's roster, admitting, "I haven't had this kind of trust in my teammates before." Houston finished the season as the West's fifth seed, earning them a rematch with the Jazz in the first round. By the time the playoffs arrived, McGrady was nursing shoulder and knee injuries, at times requiring him to receive pain-killing injections and have fluid drained from both his shoulder and knee in order for him to be able to play. The Jazz again eliminated the Rockets, this time in six games, despite a strong 40-point and 10-rebound performance from McGrady in the decisive Game 6. Following Houston's loss to Utah, McGrady underwent arthroscopic surgery on both his left shoulder and left knee. Early in the 2008–09 season, he missed 18 games, including a two-week stretch in January as his knee was not fully healed from his offseason surgery. On February 24, he had microfracture surgery in Chicago, forcing him to miss the remainder of the year. By then, his averages had declined to 15.6 points and 4.4 rebounds per game. In a surprise turn of events, the Rockets qualified for the playoffs without McGrady and advanced to the second round, pushing the eventual-champion Los Angeles Lakers to seven games. McGrady was still recovering from surgery to begin the 2009–10 campaign. On December 15, he returned to action but was limited to only seven minutes off the bench. After six games, the Rockets decided to shut him down again so that they could focus on trading him to another team. On February 18, 2010, McGrady was dealt to the Knicks as part of a three-team trade involving Houston, New York, and Sacramento. Two days later, he made his team debut, scoring 26 points in an overtime loss against the Thunder. He would finish the season with averages of 9.4 points, 3.9 rebounds, and 3.7 assists in 26.1 minutes per game. In 2010–11, he signed with the Detroit Pistons and averaged just 8 points per game, and in 2011–12, he signed with the Atlanta Hawks, averaging a career-low 5.3 points per game. On October 9, 2012, McGrady signed a one-year deal with the Qingdao DoubleStar Eagles of the Chinese Basketball Association. Qingdao finished the season in last place, with McGrady averaging 25 points, 7.2 rebounds, 5.1 assists, and 1.6 steals per game. Shortly after the conclusion of the CBA campaign, he signed with the San Antonio Spurs in time for him to qualify for their playoff roster. In 2015, McGrady's jersey number 1 was retired by Qindao. The Spurs eventually advanced to the 2013 NBA Finals, losing in seven games to the Miami Heat, which provided McGrady with the opportunity to play his first career postseason minutes outside of the first round. McGrady was selected to the United States men's national basketball team for the FIBA Americas Championship 2003 in San Juan, Puerto Rico. On August 22, McGrady led the Americans with 16 points in a 98–69 victory over Venezuela. McGrady sat out the August 26 game due to a back injury. The U.S. qualified for the 2004 Olympic Games on August 30 with an 87–71 win over Puerto Rico, where McGrady was involved in an altercation with Puerto Rico's Eddie Casiano, with fans throwing drinks and debris on the court when it happened. America eventually advanced to the gold medal game, where they defeated Argentina. For the tournament, McGrady averaged 12.6 points and 2.9 rebounds a game on 54.4 percent shooting overall and 42.1 percent three-point shooting. Standing 6 feet 8 inches tall (2.03 m) and weighing 210 pounds (95 kg), McGrady played as a shooting guard and small forward. His career averages were 19.6 points, 5.6 rebounds, and 4.4 assists per game. McGrady earned seven All-NBA honors (2001–05, 2007–08), seven All-Star selections (2001–07), two NBA scoring titles (2003–04), and won the NBA Most Improved Player Award in 2001. He was inducted into the Naismith Memorial Basketball Hall of Fame as part of the Class of 2017. McGrady was known for his laid-back demeanor and scoring prowess; he once scored 41 points in a game despite being asleep right until tip-off, a performance that inspired the nickname "The Big Sleep". Many of his contemporaries, including Paul Pierce, have called him one of the most difficult players that they ever had to guard. McGrady's playing style has been compared to George Gervin's because both players made scoring appear easy with their "smooth" approach to the game. At his peak, McGrady was an explosive player capable of finishing at the rim over the defense; in a piece for ESPN, Zach Lowe reminisced, "He glided through the lane, crouched into traffic, and accelerated suddenly -- almost violently -- through a forest of slower-moving forms, and to the rim." McGrady was also a threat from outside, and would frequently pull up for deep three-pointers over unsuspecting defenders. Some analysts have remarked that McGrady's length, playmaking, and shooting abilities would have made him more effective in the modern era of basketball, and that he was ahead of his time. On the defensive side of the ball, McGrady's effort was less consistent, but he demonstrated the ability to raise his level in meaningful games, such as during the playoffs against the Mavericks, where he often drew the assignment of guarding Dirk Nowitzki. During his time as an All-Star, McGrady was frequently criticized for not having led any team beyond the first round of the playoffs. Some analysts have defended McGrady, feeling that he was the victim of bad rosters and unfortunate circumstances. His effort level, leadership, and toughness were also questioned at times. In response to these criticisms, former Rockets coach Jeff Van Gundy described McGrady as a poor practice player but praised his coachability, unselfishness, and ability to perform well in big games. McGrady is often ranked as one of the greatest basketball players of all-time; The Book of Basketball ranked him 77th, ESPN ranked him 63rd, and SLAM Magazine ranked him 75th. In 2016, Sports Illustrated listed McGrady as one of the 20 best basketball players since the announcement of the original 50 Greatest Players in NBA History in 1996. McGrady has three children with his wife, CleRenda Harris. Their first son, Laymen Lamar, was born on December 27, 2005, during a home game in Houston, which McGrady left at halftime. Tracy's younger brother, Chancellor "Chance" McGrady, played for the 2008 NCAA Men's Division I Basketball runner-up Memphis Tigers. McGrady and former teammate Vince Carter are distant cousins; after McGrady left the Raptors, they had a feud, but it was resolved in a short period of time. In 2002, McGrady signed a longterm partnership with Adidas, agreeing to an endorsement deal that lasted through his playing career and beyond. Adidas produced a signature line of shoes for McGrady that Complex remembered as "all the buzz in the early-mid 2000's". Upon retiring, McGrady shifted his focus to his business investments, including Dasdak, a Washington, D.C.-based technology company, and Blue-04, a bottled water company in Florida. He was also an initial investor in a Minor League Baseball team which would become the Biloxi Shuckers. Since 2016, he has worked as an NBA analyst for ESPN. In 2007, McGrady traveled to the Darfurian refugee camps in Chad with John Prendergast and Omer Ismail of the Enough Project. McGrady recruited NBA players to support an initiative linking schools in Darfurian refugee camps to American middle schools, high schools, and universities. During one of his final seasons with the Rockets, he changed his jersey number to #3 in order to promote his humanitarian efforts in the region and a documentary on his summer visit called 3 Points. In 2008, McGrady was criticized for his comments on the All-Star Game being held in New Orleans, only three years removed from the destruction surrounding Hurricane Katrina. McGrady publicly questioned the quality of public safety and protection of NBA players. On February 4, 2014, McGrady confirmed that he was officially pursuing his dream of becoming a professional baseball player, working with Roger Clemens to become a pitcher for the Sugar Land Skeeters of the Atlantic League of Professional Baseball. On April 23, McGrady made the Skeeters' Opening Day roster. In his debut, he pitched ​1 2⁄3 innings, receiving the loss. In July, he started the Atlantic League All-Star Game, where he recorded his first strikeout. After the game, McGrady announced his retirement from baseball. NBA statistics per Basketball Reference. CBA statistics per CBA Data Center. Per McGrady's Basketball Reference page unless noted otherwise. ^ a b c d e f g h i j k l m n o p q r s "Tracy McGrady NBA & ABA Stats". Basketball Reference. Retrieved August 29, 2013. ^ a b c "Tracy McGrady Biography". JockBio. Retrieved April 30, 2017. ^ Reyner, Solange. "Tracy McGrady Donates Cash To Upgrade Auburndale High School Gymnasium". The Ledger. Retrieved April 30, 2017. ^ Stonebrook, Ian. "Tracy McGrady Reflects on adidas ABCD Camp & Playing LeBron on Christmas". Nice Kicks. Retrieved April 30, 2017. ^ Forsberg, Chris. "Tracy McGrady, humble but proud, highlights Hall of Fame inductees". ESPN. Retrieved September 10, 2017. ^ a b MacMullan, Jackie (March 9, 1998). "Teaching Tracy New Tricks". Sports Illustrated. Retrieved August 29, 2013. ^ a b c d e f g Golliver, Ben. "Remembering Tracy McGrady's Career". Sports Illustrated. Retrieved August 29, 2013. ^ "Vince Carter Stats". Basketball Reference. Retrieved April 15, 2017. ^ Youngmisuk, Ohm (February 24, 2000). "Tracy gives no clue; Raptors in dark on McGrady future". New York Daily News. Retrieved July 18, 2014. ^ Wertheim, L. Jon (November 1, 1999). "SI Flashback: Rare Air". Archived from the original on November 18, 2007. Retrieved July 18, 2014. ^ Sabino, David (March 20, 2000). "Sub Classification". Sports Illustrated. Retrieved August 29, 2013. ^ a b "1999–00 NBA season Summary". Basketball Reference. Retrieved August 29, 2013. ^ a b c Golliver, Ben. "Remembering Tracy McGrady's Career (Page 2)". Sports Illustrated: The Point Forward. Archived from the original on August 29, 2013. Retrieved August 29, 2013. ^ a b "McGrady named NBA's Most Improved Player". Sports Illustrated. Retrieved September 22, 2013. ^ Taylor, Phil (July 24, 2000). "More Magic Required". Sports Illustrated. Retrieved August 29, 2013. ^ Diaz, George. "Grant Hill's retirement leaves painful memories in Orlando". Orlando Sentinel. Retrieved September 22, 2013. ^ a b c d e Simmons, Bill. "The Unfortunate Tale of T-Mac". Grantland. Retrieved September 22, 2013. ^ "2000–01 NBA season Summary". Basketball Reference. Retrieved September 22, 2013. ^ "2001 NBA Playoffs Summary". Basketball Reference. Retrieved September 22, 2013. ^ Freeman, Eric. "Tracy McGrady recreates classic All-Star highlight, shows his age". Yahoo! Sports. Retrieved April 15, 2017. ^ "2002 NBA Playoffs Summary". Basketball Reference. Archived from the original on September 22, 2013. Retrieved September 22, 2013. ^ "Tim Duncan Wins Second Straight MVP Award". NBA Official Website. Retrieved April 15, 2017. ^ a b "All-Time NBArank 61-70". ESPN. Retrieved April 30, 2017. ^ "Orlando Magic at Detroit Pistons Box Score, April 20, 2003". Basketball Reference. Retrieved April 16, 2017. ^ Jefferson, Brandon. "WE REMINISCE: WHEN TRACY MCGRADY ALMOST MADE THE SECOND ROUND OF THE NBA PLAYOFFS 10 YEARS AGO". Dime. Retrieved September 22, 2013. ^ "2003 NBA Playoffs Summary". Basketball Reference. Retrieved September 22, 2013. ^ "Orlando Magic fire coach Doc Rivers". Inside Hoops. Retrieved September 22, 2013. ^ "2003–04 NBA season Summary". Basketball Reference. Retrieved September 22, 2013. ^ "T-Mac Tees Off for 62 Points in Magic Win". NBA.com. Retrieved September 22, 2013. ^ "Francis' meeting with Magic triggers trade". ESPN. Retrieved April 16, 2017. ^ a b "2004-05 Houston Rockets Schedule and Results". Basketball Reference. Retrieved April 16, 2017. ^ a b "McGrady's Big Finish Sends Rockets Past Spurs". NBA.com. December 9, 2004. Retrieved January 28, 2008. ^ "McGrady Buries Mavericks". NBA Official Website. Retrieved April 16, 2017. ^ "Mavericks Cruise Past Rockets in Game 7". NBA Official Website. Archived from the original on March 10, 2008. Retrieved April 16, 2017. ^ Associated Press. "NBA notes: Back injury ends night for McGrady". Deseret News. Retrieved April 27, 2017. ^ "2006 NBA Playoffs Summary". Basketball Reference. Retrieved April 27, 2017. ^ "Back treatment has McGrady feeling good". Chron.com. December 29, 2006. Retrieved January 28, 2008. ^ "2007 NBA Playoffs Summary". Basketball Reference. Retrieved April 27, 2017. ^ SLAM Staff. "Tracy McGrady: Bottled Rocket". SLAM Magazine. Retrieved April 27, 2017. ^ "Jazz deliver Rockets first franchise Game 7 loss at home". ESPN.com. May 5, 2007. Retrieved January 28, 2008. ^ Broussard, Chris. "Tracy McGrady peeled to Heat's run". ESPN. Retrieved April 27, 2017. ^ "2008 NBA Playoffs Summary". Basketball Reference. Retrieved April 27, 2017. ^ "McGrady hopes for a cure-all in remaining games". April 11, 2008. ^ "Knee holds back T-Mac". April 28, 2008. ^ a b "McGrady scheduled for season-ending surgery". February 23, 2009. ^ "Third-quarter surge sends Jazz into Western Conference semis". Associated Press. May 2, 2008. ^ "McGrady undergoes arthroscopic surgery on shoulder, knee". Associated Press. May 2, 2008. ^ Associated Press. "McGrady says he's out for the season with knee injury". USA Today. Retrieved April 30, 2017. ^ "McGrady to have knee surgery Tuesday". February 23, 2009. ^ Associated Press. "Gasol, Lakers overwhelm Rockets in Game 7". ESPN. Retrieved April 27, 2017. ^ a b Harrel, Patrick. "Wednesday Links: Revisiting The Kevin Martin-Tracy McGrady Trade". The Dream Shake. Retrieved July 19, 2017. ^ "Tracy McGrady 2009-10 Game Log". Basketball Reference. Retrieved July 19, 2017. ^ "Knicks Acquire Seven-Time All-Star Tracy McGrady". NBA.com. February 18, 2010. Retrieved February 19, 2010. ^ "The Game Happens Here". NBA.com. Retrieved March 8, 2011. ^ Zimmerna, Kevin (October 9, 2012). "Tracy McGrady signs one-year deal in China". SB Nation. ^ "CBA: Season 2012–2013". Asia-basket.com. April 3, 2013. Retrieved March 1, 2014. ^ "Qingdao Double Star Eagles Statistics 2012–13". Basketball.asia-basket.com. Retrieved March 1, 2014. ^ "Spurs sign McGrady for playoffs". Msn.foxsports.com. April 17, 2013. Retrieved March 1, 2014. ^ Austin Ngaruiya (October 8, 2015). "A Brief Explanation Why Tracy McGrady Got His Number Retired In China". Uproxx.com. Retrieved March 5, 2018. ^ Adande, J.A. "New role, new heights for T-Mac". ESPN. Retrieved April 15, 2017. ^ "Tracy McGrady has retired from NBA". Insidehoops.com. Retrieved March 1, 2014. ^ Tracy McGrady Announces Retirement on First Take on YouTube "ESPN First Take" channel. ^ "2003 USA Basketball Men's Senior National Team". NBA Official Website. Retrieved April 29, 2017. ^ "Notebook: Venezuelans fall short in U.S. show". Seattle Times. Associated Press. August 23, 2003. Retrieved April 28, 2013. ^ "Notebook: U.S. knocks off Argentina to avenge loss from 2002". Seattle Times. Associated Press. August 27, 2003. Retrieved April 28, 2013. ^ Sheridan, Chris (Associated Press) (August 31, 2003). "Notebook: U.S., Argentina clinch berths in Olympics". Seattle Times. Retrieved April 28, 2013. ^ Sheridan, Chris (Associated Press) (September 1, 2003). "U.S. dunkers glitter in gold-medal game". Seattle Times. Retrieved April 28, 2013. ^ "Men's Tournament of the Americas – 2003". USA Basketball. Archived from the original on May 4, 2013. Retrieved April 28, 2013. ^ "Tracy McGrady Stats, Bio". ESPN. Retrieved April 30, 2017. ^ a b "That Was Then ... This Is Now: Iceman and T-Mac". NBA.com. January 27, 2003. Retrieved January 28, 2008. ^ Pierce, Paul. "The Five Toughest Players I've Ever Guarded". The Players Tribune. Retrieved April 30, 2017. ^ a b ESPN.com. "Is Tracy McGrady a Hall of Famer?". ESPN. Retrieved April 30, 2017. ^ a b Lowe, Zach. "T-Mac was the original YouTube basketball superstar". ESPN. Retrieved September 10, 2017. ^ Howard-Cooper, Scott. "Criticized for not winning enough, Tracy McGrady vindicated by Hall of Fame selection". NBA Official Website. Retrieved April 30, 2017. ^ "Bill Simmons Hall of Fame Pyramid". Basketball Reference. Retrieved April 30, 2017. ^ "SLAM 500 Greatest NBA Players of All Time". Basketball Reference. Retrieved April 30, 2017. ^ Golliver, Ben. "Top 20 NBA players of last 20 years". Sports Illustrated. Retrieved April 30, 2017. ^ Ruger, Todd. "Mom awarded $54,000 a year in paternity case". Herald-Tribune. Retrieved April 30, 2017. ^ "Okur, Jazz take advantage of McGrady-less Rockets 82–74". Usatoday.com. December 29, 2005. Retrieved March 1, 2014. ^ "Chance McGrady Bio". University of Memphis Athletics. Retrieved April 30, 2017. ^ "Vince, Tracy no longer a family feud". ESPN.com. January 23, 2001. Retrieved January 28, 2008. ^ "NBA marketers look for next Mike". USAToday.com. May 27, 2002. Retrieved January 28, 2008. ^ Gandu, Gurvinder Singh. "A History of Tracy McGrady in the adidas T-MAC". Complex. Retrieved April 30, 2017. ^ "Tracy McGrady: "I didn't want to go to a team to chase a championship"". HoopsHype. January 3, 2012. Retrieved January 30, 2014. ^ "Former NBA player Tracy McGrady getting ready for a minor role in baseball". New York: NY Daily News. February 22, 2014. Retrieved March 1, 2014. ^ "Tracy McGrady - NBA Analyst". ESPN MediaZone. Retrieved April 30, 2017. ^ a b Feigen, Jonathan (October 1, 2007). "McGrady says he'll spread word about Darfur". Houston Chronicle. Retrieved March 8, 2011. ^ "Houston Rockets' Tracy McGrady to wear No. 3 to spotlight Darfur work – ESPN". Sports.espn.go.com. July 14, 2009. Retrieved March 8, 2011. ^ a b Feigen, Jonathan (March 1, 2007). "T-Mac has issues with New Orleans as All-Star site". Houston Chronicle. Retrieved March 8, 2011. ^ Snyder, Matt (February 4, 2014). "Tracy McGrady, Sugar Land Skeeters have mutual interest". cbssports. Retrieved February 5, 2014. ^ "Tracy McGrady to try baseball," ESPN, February 5, 2014. ^ Singer, Mike (April 23, 2014). "P Tracy McGrady makes Sugar Land Skeeters". cbssports.com. Retrieved April 24, 2014. ^ Dolan, Brett (July 17, 2014). "T-Mac Retires From Baseball". CBS Local. Retrieved July 18, 2014. ^ "Tracy McGrady retires from baseball". ESPN.com. July 17, 2014. Retrieved July 18, 2014. ^ "当前位置：CBA数据中心" [Current position: CBA Data Center] (in Chinese). Cbadata.sports.sohu.com. Retrieved March 1, 2014. ^ "Tracy McGrady, Bill Self, Rebecca Lobo and Muffet McGraw Headline Class". Naismith Memorial Basketball Hall of Fame Official Website. Retrieved April 29, 2017. ^ "Men's Tournament of the Americas -- 2003". USA Basketball Official Website. Retrieved April 29, 2017. ^ Flores, Ronnie. "Mr. Basketball USA Tracker week 8". ESPN. Retrieved April 30, 2017. ^ "T-Mac Tees Off for 62 Points in Magic Win". NBA Official Website. Retrieved April 29, 2017. ^ a b c d e "Orlando Magic Season Leaders". Basketball Reference. Retrieved April 29, 2017. ^ a b "Orlanda Magic Career Leaders". Basketball Reference. Retrieved April 29, 2017. This page is based on the Wikipedia article Tracy McGrady; it is used under the Creative Commons Attribution-ShareAlike 3.0 Unported License (CC-BY-SA). You may redistribute it, verbatim or modified, providing that you comply with the terms of the CC-BY-SA.